The acquisition of Lloyds consumer durables business gives Havells an entry into this high-growth segment. In 2010, a group of distributors and dealers asked Anil Rai Gupta, the Chairman and Managing Director of Havells India, if he had any plan to manufacture air-conditioners (ACs). Havells had by then transformed itself from a pure industrial to a consumer business and established itself in the premium ceiling fan category. It was these fan buyers who were enquiring about ACs. The dealers decided to put the thought into Gupta's mind. The company, which has a long history of making acquisitions to enter new areas, was not averse to the idea. Gupta hired a team for a feasibility study. The segment, it found, was under-penetrated; just 2 per cent households owned an AC. Opportunities were huge. However, after six months of studying the market, the company concluded that it did not have the technological know-how or distribution prowess to get into the business. The aggression of the Korean companies -Samsung and LG - was another worry. "There was some apprehension that if they could change the TV industry in a way that companies such as BPL and Videocon were out of the picture, would they do the same in ACs?," says Gupta. "The threat of the Koreans was clear. We decided against making an organic entry. We thought if we got an opportunity to make an entry through an acquisition, we would do that," he says. Last month, the company did just that - by acquiring the consumer durables business of Lloyd for Rs1,600 crore. The addition of Lloyd's portfolio of ACs, LED televisions and washing machines to Havells' domestic appliances such as fans, water heaters and lights, makes the latter a full-fledged consumer durables player. This also pits it, for the first time, against global heavyweights such as LG and Samsung, as well as domestic leaders such as Voltas. Will Havells be able to hold on to its own? Or has it bitten more than it can chew? On February 20, the day after the acquisition was announced, share prices of both the companies fell on the Bombay Stock Exchange. Havells fell 2.66 per cent while Lloyd fell 16.75 per cent. Over the course of the week, Havells fell another 3 per cent, before recovering. These movements were first indication that investors had some concerns about the deal, though there was little to dispute the valuation - Havells was essentially paying for the brand and the network. Neither does it look like that funding will be an issue as Havells has Rs1,400 crore cash and no debt. It plans to raise some debt and pay the rest from its cash pile. However, what is worrying investors is the low profitability of Lloyd and its impact on the combined entity's balance sheet. Even though the stock market seems to have absorbed this for now, the concern is still valid. "The cost is fair considering that Havells gets an entry into the fast-growing consumer durables segment. However, turning around the business could be a challenge considering the relaxed terms of trade offered by Lloyd and competition from companies with strong financials such as LG, Samsung, Voltas and Daikin," Chirag Muchhala, Research Analyst, Nirmal Bang Equities, wrote in a report. "Further, it will dilute Havells' financials in the near term (next two years) as Lloyd has a much weaker margin profile. While the entry into consumer durables could aid long-term growth (assuming it successfully turns around Lloyd), in the transition phase we will be cautious." Lloyd's operating margins are 6 per cent; the figure for peers is 10-13 per cent. The brand recall, too, is limited, which is a surprise, as brand value has been central to the acquisition. There is a reason for this. After its re-entry into the consumer market in 2008 - Fedders Lloyd was one of the oldest AC maker in India but went bankrupt in 1990 - Lloyd sought out markets in smaller towns and rural areas, where competition is relatively less intense. Its serious foray into big cities is recent. As a result, its brand recall is not that strong. Analysts say it will have to continue investing in marketing and advertising, which means a quick improvement in margins can be ruled out. "Margins are thin, which makes the company that much riskier. If they were 13-14 per cent, it would have been a better play. But I sense an opportunity here as the company has good potential," says Gupta. "It is work in progress. They have been smart in distribution by first focussing on Tier-II and Tier-III markets. So, from the point of view of a very premium customer from a big city, the mind space is less, but from product, distribution, relationship and service point of view, they are right up there with the A brands. All Lloyd needs is a bit of confidence," he says. Of the three product categories in Lloyd's portfolio, ACs contribute 70 per cent to revenues. This is the only segment where it has a sizeable presence (14 per cent) and is the third-largest player, behind Voltas and LG. Its presence in TV and washing machines is minuscule. India's residential AC market is grossly under-penetrated. 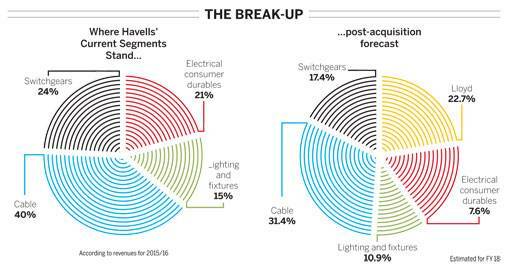 Sales are expected to more than double, from four million in 2016 to 10 million by 2020, which offers sufficient room for Havells to grow. That is why, for some time, the focus will be on ACs and television; washing machines will be on the back burner. "ACs will be the mainstay. We believe that over the next two-three years, an investment of Rs200-300 crore will be needed to set up a manufacturing facility, change the perception of the consumer, and for new technology. There will be lot to do in ACs," says Gupta. "I am not too concerned about profitability at this point in time. The industry is not as competitive as they (analysts) say. Most players have double-digit margins. Lloyd has invested heavily in building the brand in the past 10 years. Now is the time to leverage that. We are not in the game of growth versus profitability." The ambition is clear. 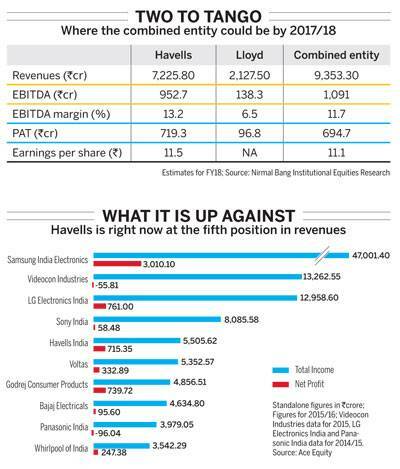 Havells is not content playing second fiddle in any segment and wants Lloyd to challenge Voltas at the top. In his vision for the group, Gupta wants Havells and Standard (its electrical value-for-money brand) to retain and strengthen its appeal as a consumer electric brand while Lloyd becomes the group's main consumer appliance brand. "In 2007, Havells' turnover was Rs1,600 crore. This year, it will be Rs6,000 crore. We have grown at 15-16 per cent a year. During this period, our margins also grew from 7 per cent to 14 per cent," he says. "We have grown faster than the market and at the same time improved margins. This is what we will do in Lloyd as well. We will strive to grow faster than Voltas and maintain margins similar to that of the industry." Though the Lloyd story under Havells will begin with ACs, it will gradually extend to other products too. Gupta admits that breaking into the LED panel market will not be easy but is up for the challenge. "We will continue to leverage the distribution network for LED panels and washing machines too. And, over a period, refrigerators as well. We will not take back any product," he says. "Over a period, we do not want to be considered as an AC manufacturing company but a full-fledged consumer durables player."